[SINGAPORE, 12.February. 2019] – As part of Huawei’s global initiative to nurture new information and communications technology (ICT) talents, the global ICT solutions provider and Singapore University of Social Sciences (SUSS) have signed an agreement to set up an ICT Academy on the varsity level in Singapore. It will be the second Huawei ICT academy launched in Singapore. The partnership aims to address the shortage of ICT professionals in Singapore through joint research, education and training programmes. Both parties will set up a platform for technical collaborations. The training will help to bridge the gap between graduates and their transition to the workforce as students will be equipped with industry-ready ICT skillsets. SUSS undergraduates will have practical trainings from non-profit Huawei Authorized Information Network Academy (HAINA) trainers, and earn a Huawei Certification that will prove invaluable for their career. In addition to the various HAINA industry certifications available — from security, big data, cloud computing technologies, networking technologies and IT storage systems — students will work on hands-on projects. The entire curriculum and certification process is expected to spread over 3-6 months. Mr Aaron Wang Shaotong, Managing Director of Huawei’s Enterprise Business Group in Singapore, and Prof Attalah Samir, Dean of School of Science and Technology at SUSS, signed the agreement at the SUSS campus on Monday (Jan 28), witnessed by Mr Jim Lim, Global Senior Director, Huawei CTO office and Prof Tsui Kai Chong, Provost of SUSS. “Huawei’s HAINA programme is part of our wider commitment to STEM education as well as research and development. 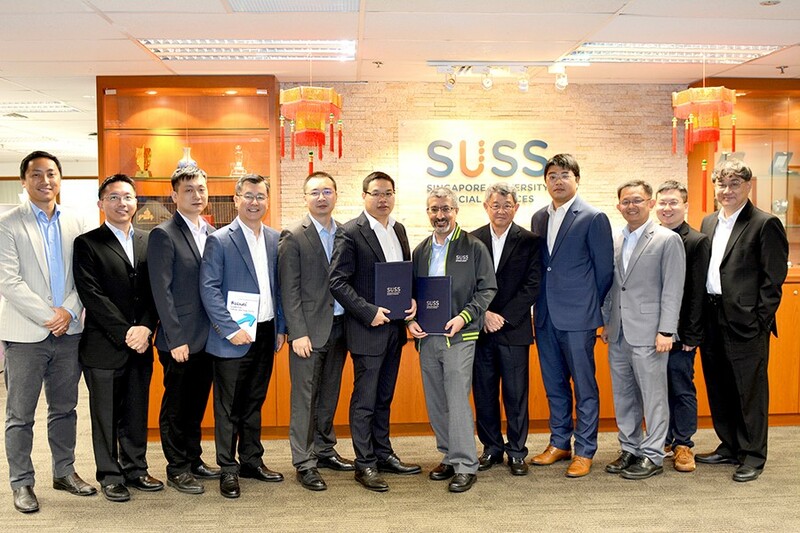 We are confident that our partnership with SUSS will give students the opportunity to learn new and relevant industry skills, enabling them to fulfil their ambitions in science and technology and contribute to Singapore’s digital economy,” he added. Huawei is currently cooperating with over 350 universities to open Huawei ICT academies around the world, with about 200 in China. Last year, the Academy trained over 12,500 students globally. Among them, 4,000 students received certifications for their skills. Under the HAINA programme, Huawei also runs a global annual ‘Skills Competition’ for students, giving local country winners the opportunity to visit China for the finals and compete with students from across the globe.